The UK is further along the road to climate madness than Australia, but where the UK now stands provides a possible vision for the future in Australia, if the Labor/Green policies are allowed to continue unhindered. Both the UK and Australia have the same characters in this vulgar melodrama, just a different cast. In the UK, the long-suffering public has to deal with that eco-lunatic Chris Huhne, Mr Windmill, who is systematically strangling the UK’s fossil fuel energy production capacity, without having seriously considered what can replace it. In Australia we have Bob Brown, a blinkered environmental extremist, completely disconnected from the real world. If we have learnt anything from the financial crisis, it is that clear rules implemented properly can prevent the toxic build-up of risk. A recent survey of large global firms found that 83 per cent of business leaders think a multilateral agreement is needed to tackle climate change. Businesses want certainty; only the politics lags behind. A commitment to a new agreement will provide that certainty – and Kyoto provides the basis of the rules we need to manage a destabilising climate. Durban must not be the end of Kyoto, but a chance to build on what it began. We recognise that it will take time to negotiate this. So we also want immediate action. Current voluntary pledges to reduce emissions are not yet enough; in Durban, we should agree that we must close the gap, building momentum towards a major review of ambition. We must build the system we use to measure and verify emissions cuts. We must do more on long-term financial support for developing countries and agree how the new Green Fund will operate. And we must continue to reduce emissions from deforestation. Above all, we must show leadership. Next year I will continue to press for a more ambitious EU emissions target: a 30 per cent reduction by 2020. That will help us raise our sights globally. To quote The Thick of It, Huhne is “disconnected to the point of autism”. When the rest of the world is backing away (apart from Australia, of course), the UK is heading for even deeper emissions cuts! And his quoting of Friedman shows that this entire facade is pure politics. Skating over the fact that this isn’t keeping a good idea alive, but a bad idea struggling for breath and surviving only thanks to a ventilator, Huhne is on a political crusade which will not be sidetracked by trivial matters like another GFC. Pity the poor Brits. A third article in the Telegraph here, explains how Huhne will give such long-term financial support to developing countries: GBP 1 billion of British taxpayers’ money will be sent to Africa to help them “tackle climate change.” Given the parlous state of the UK economy, you’d have to conclude that their priorities are a little out of kilter… Check out the comments on that one. It is hard to know where to begin, after a week which opened with The Sunday Telegraph’s exclusive on a blast of realism from Prince Philip over the folly of our Government’s infatuation with useless windmills. Then came an excoriatory report from the House of Lords on how we have so run down our nuclear expertise that it is doubtful whether we can hope to run a new generation of nuclear power stations. Next, there was a report from a leading Swiss bank finding that the EU’s “emissions trading scheme” has wasted $287 billion (£186billion) over six years – paid by all of us, to achieve nothing in terms of reducing “carbon emissions”. There was also a front page story in another newspaper, warning that (as readers of this column have long been aware) within nine years we could all be paying nearly £300 a year to subsidise solar panels and those same useless windmills. All this madness ultimately rests on a blind faith in the threat of man-made global warming, which no one has done more to promote than the scientists whose private emails were again last week leaked onto the internet. It is still not generally appreciated that the significance of these Climategate emails is that their authors, such as Michael Mann, are no ordinary scientists: they are a little group of fanatical insiders who have, for years, done more than anyone else to drive the warming scare, through their influence at the heart of the UN’s Intergovernmental Panel on Climate Change. And what is most striking about the picture that emerges from these emails is just how questionable the work of these men appears. We see how they torture the evidence to support their theory – even to the point where some of them seem to lose faith in the story they are trying to tell. And we also see how rattled they were as soon as their work was challenged by expert outsiders such as Steve McIntyre, the mathematician who exposed the methods used to create Mann’s “hockey stick” temperature graph, which the IPCC had made Exhibit A for their theory. Again and again we see them trying to defend the indefensible, giving vent to wild personal abuse of the enemies of what they call their “cause”, and stopping at nothing to keep their critics’ evidence out of IPCC reports and scientific journals, and prevent dissenting views from getting media atention. Australia is actually better placed than the UK to retreat from the madness. At least we have a political party that opposes pointless carbon taxes and emissions trading schemes. All the major parties in the UK support the kind of nonsense Huhne is proposing, although there are signs of retreat there as well. The big question, however, is this: Will sanity prevail before it’s too late? Will sanity prevail before it’s too late? … No. Which party would that be? The Climate Skeptics Party? You do realise the Liberals have a “Direct Action” policy that is no less expensive than CEF and just as pointless? Our political problem is that despite the lack of scientific evidence for CAGW, the numerous historic evidence for the extreme improbability of a global warming catastrophe, and the ClimateGate leaks showing the whole thing was trumped up beyond reason from the get-go, Tony “Unification of Church and State” Abbot has retreated from his formerly accurate and succinct position that “global warming is crap”. Instead he is saying “it” is real and we have to do something about “it”, and in a plot twist that no-one could have foreseen, centralised planning of the economy is his ineffective solution. It’s like someone slipped the Red pill into our cuppa 2 years ago. Once we’ve purged parliament of the communists in the guise of the Green/Labor symbiosis, we ought to follow it up by purging the now socialist Liberal party, and chuck out the Goldman-Sachs assets while you’re at it. That means getting rid of Malcolm “GS” Turnbull too, who no doubt is waiting in the wings to help out his bankster buddies at our expense. There is no current candidate that is trustworthy from any side. There are probably quite a few politicians in our midst that would shine if only they would first unshackle themselves from the Party Politics system and give us some real democracy. Spot on and well said Andrew! Yes, correct, but it is far easier to walk away from Abbott’s direct action nonsense than a legislated carbon tax with an entrenched bureaucracy costing billions to unwind. Abbott, I am sure, still thinks AGW is “crap” but is playing a delicate political game. The electorate isn’t yet ready for a major party leader to utter such heresies in public, hence the softly, softly, touchy-feely approach. When in government, I’m sure it will be a different story. At least, I hope it will be. Just finsihed listening to a radio program with Dennis Cuddy Phd who spends a lot of timer tracking what the globalists get up to – the bottom line is this – the plan seems to be establishing global fuedal socialism. Socialism means no mioddle class or a greatly economically strangled one. The UK and australia have good-ish ecominies. How do you strangle a good economy? You cut its economic “tendons” with a tax that will increase very year, slowly bringing the economy to destruction and set the “dogs” of the elite upon it. 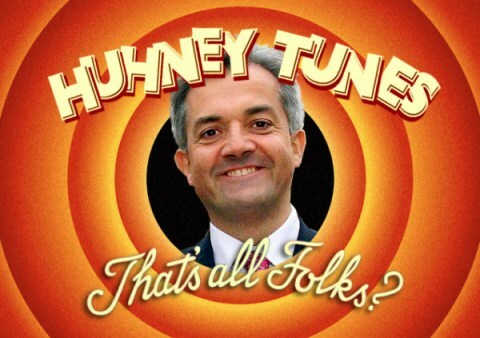 Huhne is a just a bit part actor who is following a script to destroy the UK economy. This is the only logical and rational explanation.